Why does Obama fail to Understand American culture? Heh…Wonder why the press didn’t find this five years ago. America’s watchdog seems to be at sleep at the wheel, and the fact that a two bit blogger found this public photo in at least two places suggests a major problem with mainstream American news reporting. Carelessness or bias? Who knows. I myself find this “new” information on the president more amusing than upsetting. I’m sure the right wing conspiracy will go bonkers over the photo, but to me it’s a non issue, since the law about “natural born” citizens was to stop rich foreigners from coming over and taking over the government, not to keep the children of American citizens who were born overseas from being president. Personally, I think the American president was born in Hawaii, but like the faux-Cherokee Elizabeth Warren, was using the claim of foreign birth to enhance his credentials. 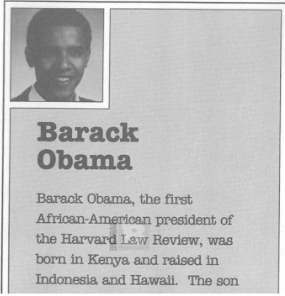 The problem for the right is that he was “born” in Kenya. 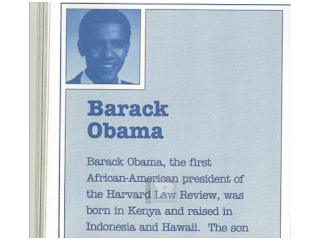 My problem with the photo is that it suggests he lied about being born in Kenya to get ahead in college. But my real problem with President Obama is that his view of society is at odds of that of most Americans. I suspect President Obama (in contrast to President Clinton) really doesn’t have a politician’s “feel” for the average American: how he thinks, how he works, how he views the family. (I am using “he” as a gender neutral pronoun). Is it because President Obama was raised first in a foreigner’s compound in Indonesia? Is it because he then moved to be raised in a suburb and studied in an elite prep school in Hawaii? Is it that he has had so has had little contact with people outside his small group that he has a problem with understanding that other people think and use different criteria to make a decision? Yes, he was a “community organizer”, but that doesn’t mean he understood those he was trying to help.Â I’ve been a “do-gooder” in several non European cultures, both in the US and overseas, and know that not all those working to help others understand those they are trying to help: indeed, some do-gooders don’t even like those they are trying to help. Some “do-gooders”, alas, see those they are supposed to help as pets to be trained rather than people who have independent wants and needs which might not correspond with what we think they need. Alas, we don’t have many reports on what he did as a community organizer. I haven’t seen articles interviewing local folks he helped either: did he hang out at the local guys at the bar after work, shoot hoops with the kids, attend the pot luck supper at the local the Baptist church? Or did he hang out only with other “community organizers” in posh pubs in his spare time, discussing all the good things they are doing, and making more plans to help them in the future? 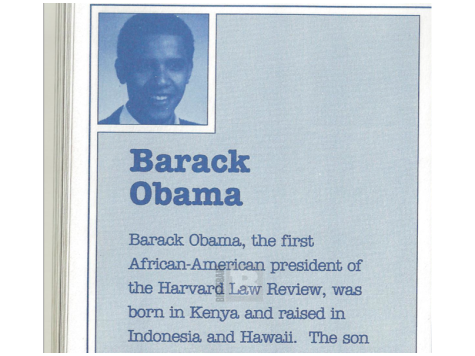 Maybe this is why President Obama does not “understand” much of America: he has always been an outsider. Which is surprising since his mother was an anthropologist, whose work understood and described how other cultures worked. (Her work on the spiritual meaning of the blacksmith’s work in rural Indonesia was outstanding). I discussed this problem at the end of this essay, where I contrasted East Asian Confucian values vs American communitarian values vs Obama’s “there is a government program to help Julia” values. True, it is not just the problem of Obama, since much of the elite opinionmakers have a similar cluelessness. But opinionmakers can be ignored, whereas the president is supposed to understand the views of everyone in the country even if he doesn’t agree with them. He should be able to educate them to his point of view, not by calling them names (his phrase “clinging to religion and guns” was said of blue collar Democrats, and they still remember this with wrath) but by showing them how his programs help them. Another problem with the President: He has to be able to explain how his programs will help them without destroying the social capital nurtured by family, local governments, churches, and neighborhood institutions. His cluelessness about how his health care program threatens the Catholic church’s institutions is one egregious example of this; the “Federal Sandwich police” that order schools what to feed the children (who often refuse to eat the food) is another. A good example of American communitarian values is found in this essay, which shows how the LDS church members help each other. In my experience, it is true. When I was a small town doc, and a woman was LDS and couldn’t pay her medical bills, the church would pick up the tab. When our neighbor was sick and her husband too drunk to care for her, we (aka me, her doc, and my back-slidden Baptist next door neighbor) helped her find a new home to rent and apply for welfare and a divorce, but it was the LDS church who found friends to help to her clean her house and supplied her food to eat, and when she was better, got her a job helping can foods for the food pantry etc. and then later they found her a permanent job. What that article overlooks is that Mormonism is an American religion, and the church stresses American values. In America, if there is a problem, people get together and help each other solve it. Government may help, but it should be a resource, not the only answer, or even maybe not the best answer for social problems. My point is that the LDS make this part of their dogma, but in small town America— and in inner city ethnic neighborhoods– you still have neighbors helping each other all the time. The article on the LDS calls this “social capital”, and it is another missing discussion in the election, because neither President Obama nor the elite pundits recognize it as a reality. There is less “social capital” in big, impersonal apartment buildings (where the very rich and very poor live) or in detached suburbia…because the former makes folks feel like they live in an impersonal warehouse rather than a home…the latter, because the detachment grants privacy but means you are less likely to interact with your neighbors on a day to day basis. Without social capital, you have a “Julia” whose every need in life is helped by a faceless government program, but there is no mention of family ties, husband, or children or neighbors or friends or fellow church members or social clubs or even fellow bowling league friends in the narrative. No one is there to help her in her need except a monolithic “one size fits all government program. There is a need for help from federal or state governments, especially in times of distress or disaster, but the “one size fits all” huge federal bureaucracy approach to all problems not only is expensive, but discourages the community approaches to the problem. Alas, it seems that this year’s American election cycle is one where the pundits and the President insist that federal programs as the “only” way to solve a problems, so vote for me. They simply won’t discuss (or maybe aren’t aware of) the ideas of subsidarity, social capital, and other communitarian values. In contrast, too manyÂ Republicans are into economics as the basis for decisions, it is unlikely that there will be a discussion of what American society is, and where it is going. Will Romney, whose experience in business and whose LDS culture of communitarian help gives him a different point of view, be better able to discuss and explain these nuances? No user commented in " Why does Obama fail to Understand American culture? "